Mrs. Younhee Shin will be presenting Korean Spirit & Culture. Dear Rotarian My name is Younhee Shin and I am a program coordinator in KSCPP. Korean Spirit & Culture Promotion Project (KSCPP) is a 501 (c) (3) non-profit organization that is dedicated to raising awareness of Korean history and culture. In appreciation for the United States’ support for Korea during the Korean War and in the years that followed, since 2009, KSCPP has held 1,700 presentations about the history and culture of Korea including 350 different rotary clubs throughout the country and in Europe. At the meetings, we presented film about the history of Korea from ancient to modern times: KOREAN SPIRIT AND CULTURE PROMOTION PROJECT Cordially Invites the Members of the Club to: The Hidden Treasure of Korean Art and Modern Korea Once known as the Land of the Morning Calm, Korea now possesses the 10th to 12th largest economy in the world and is becoming more and more important in the world's economy, culture and politics. Two documentary films about Korea will be shown. The first film illustrates the cultural achievements of Korea's past, and the second film shows Korea's industrial achievements since the Korean War. Please do not hesitate to contact me at any time. 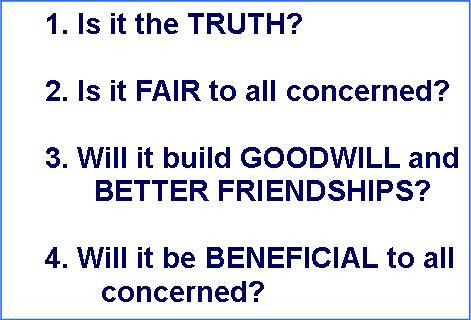 We are always looking for new opportunities to give programs and talks. Kind Regards, Younhee Shin KSCPP - Program Coordinator Cell: (917) 838-4689 www.kscpp.net *KSCPP is a 501(c)3 non-profit organization dedicated to educating Korea's unique history and culture. Joseph D. Courtney (born April 6, 1953) is the U.S. Representative for Connecticut's 2nd congressional district, serving since 2007. The district includes most of the eastern third of the state, including Norwich and New London. He is a member of the Democratic Party. Many of the programs Access provides are delivered directly to customers who walk through our doors looking for assistance. With offices in Willimantic and Danielson, our Family Advocates are on hand to help customers find what they need to make ends meet and take steps towards greater financial stability. In addition, Access makes a difference in the community by providing programs for customers that are referred through DCF and the CT Judicial System. These include our programs to foster positive at-risk youth development and our supportive housing programs. Like all our services, referral programs help those in need achieve stability and success. We are endlessly grateful for the assistance you continue to offer to our Jeannette HORBAITA Center.. It is such a comfort for us to have this money, because it is a huge support for our mission with these young girls who are getting ready to take their own future in hand. The money you gave us ($2000.00) was welcomed and was used to buy some computers. These young women like to work with computers, and it also open them up to the modern world. We thank you again. May God bless you! 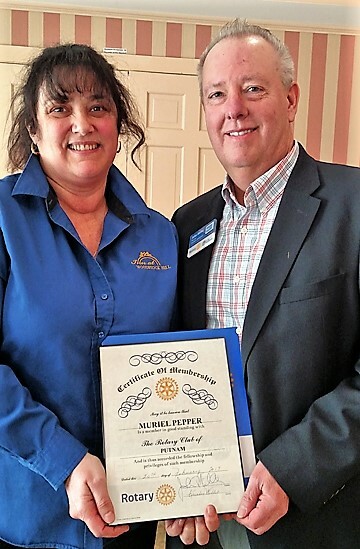 Muriel Pepper, manager of the Inn at Woodstock Hill (shown with club President John Miller) and Putnam Police Officer Dana Peloso were recently welcomed to the Putnam Rotary Club family. Peloso stands with his sponsor Jeff Rawson, left, and club President John Miller, right. Courtesy photos. 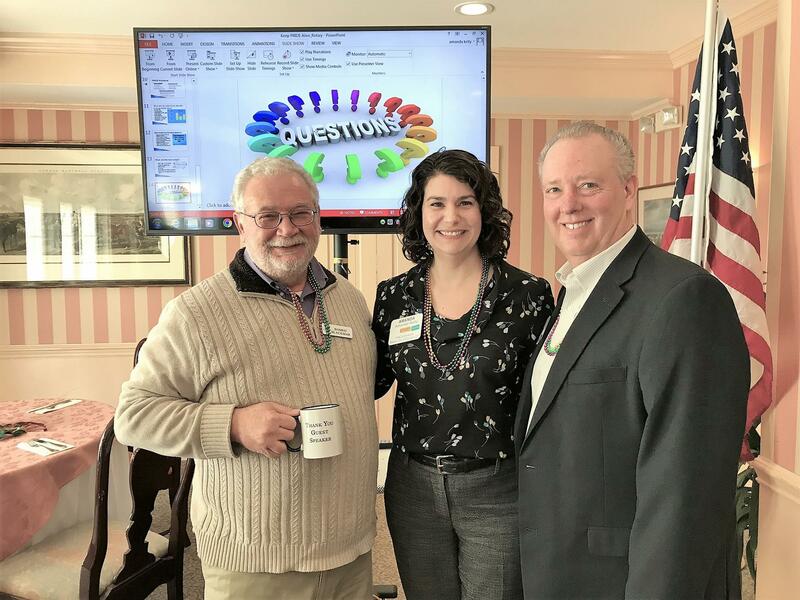 The Putnam Rotary Club spent part of its recent meeting learning about Abraham Lincoln. 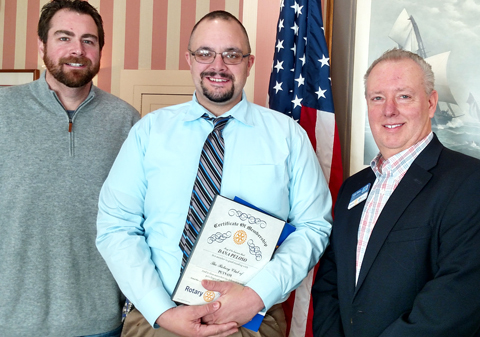 Bill Juzwic, a funeral director at Gilman and Valade Funeral Homes & Crematory, spoke to Rotarians. The funeral home presented a week-long display of a replica of Lincoln’s casket and other items from that time. Putnam Rotarian Robert Fournier Jr. owns Gilman and Valade Funeral Homes & Crematory. Photo courtesy of Valentine Iamartino.